Having experienced authentic Spanish cuisine in Barcelona (see my post on Gaudi's amazing creations here) and Andalusia last year, the hubby and I have cravings for Jamon Iberico and tapas from time to time. Before we discovered Binomio Spanish Restaurante at 20 Craig Road, we liked to frequent Catalunya, partly for the ambiance and lovely view (see my review of Catalunya here). Binomio has two sections, a more casual bar atmosphere for tapas, and a seated fine dining restaurant. I'd been to the tapas bar before (and it was excellent) so I was excited to experience the restaurant for the first time. The service here was as exceptional as I remembered - warm, welcoming, hospitable and accommodating (the latter being a rarity in the Singapore food scene, where rules and rigidity tend to take precedence). 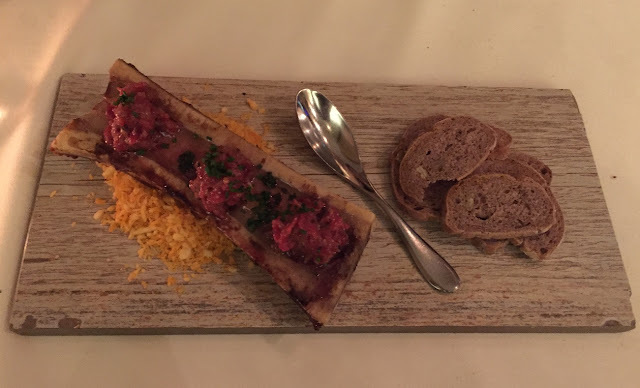 The menu offers a wide selection, and in order to sample as much as possible, we opted for a variety of tapas (and on the suggestion of the maitre'd, some of the main courses in tapas-sized servings). To start, we had a plate of jamon, which was served with thick crusty bread and a tomato puree. I cannot recommend this enough - the combination of flavour-packed jamon balanced with the sweetness of the tomato and textural crunch of the bread was perfect. The dinner was off to the cracking start, and we eagerly awaited our tapas. As we couldn't decide which croquettes to order (there are two of the menu), we ordered a mix of both: the Croquetas Binomio (ham, chicken and boiled egg croquettes) and the Croquetas de setas (mushroom croquettes). Both versions were delicious - delicately crispy and full of creamy flavour inside. Next came the Tallarines de sepia (grilled cuttlefish with sofrito and veal vinaigrette), which I was intrigued with after our waiter described the dish as something like calamari noodles. When the dish came out, I could see that it had been aptly described. The cuttlefish had been finely prepared to resemble strands of noodles, and the sauce was subtle but aromatic. We also tried the char-grilled pork belly with razor clams and cauliflower puree, the Atlantic octopus "A Feira" style and the grilled bone marrow with aged steak tartare. All three dishes were well-executed and packed full of flavour. In particular, the bone marrow and steak tartare was indulgently rich, and the crispy bread was a much-needed accompaniment to mop up the meaty juices. Our final savoury dish of the night was the Fideua Negra (squid ink noodle paella). Instead of rice, this dish which originated from Gandia in Valencia uses thin noodles. This was my first time trying fideua, and I thought the noodles made the dish lighter when compared to the usual rice paella. The flavours of squid ink, calamari and aioli complimented each other and I really enjoyed it. Of course, no dinner would be complete without dessert, and I was delighted to see that Binomio's dessert menu included that Spanish classic, churros with chocolate sauce. The churros were spot-on - thin sugar coated doughnut sticks, and rich dark chocolate dipping sauce. Unfortunately the other dessert we ordered was less impressive - the blackforest cake with raspberries. It was a deconstructed version of traditional blackforest cake and while it looked beautiful, I thought that flavour-wise it paled in comparison to the original. Luckily, the surprise hazelnut chocolate birthday cake the hubby had arranged made up for my cake cravings! Overall, the quality of the food and the standard of service makes dinner at Binomio Fine Dining an enjoyable night out. I would recommend making an advance booking for the restaurant, otherwise you can try your luck at the bar. Binomio is located at 20 Craig Street, Craig Place, #01-02, 089692 (Phone: 6557 0547).